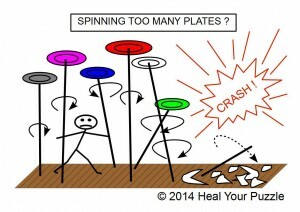 Heal Your Puzzle » Blog Archive » Spinning Too Many Plates? Do you ever feel like you are trying to keep too many plates spinning? Or too much on one plate? Work, health, family, friends, me-time, money, cars, home, the World…? The lists may feel endless sometimes… How about if all of it was on one plate, properly proportioned to suit you and healthy from every perspective? Wouldn’t that feel easier to manage? How about if it all kept spinning on its own without you having to keep it going? Wouldn’t it just be great to enjoy it all, be part of it but not feel responsible for all of it? Be able to flow with life, grow and enjoy, rather than it all feeling like it’s a matter of survival and avoiding ‘CRASHES’? SO WHAT NEXT? WHERE ARE THE SOLUTIONS?